The latest statistics on hunger in the city tells the proverbial Tale of Two Cities as a Tale of Two Pantries. This Thanksgiving, New Yorkers will be asked to “Remember the Needy.” But for millions of households, that starts with thinking about themselves. The latest statistics on hunger in the city tells the proverbial Tale of Two Cities as a Tale of Two Pantries. New York’s abysmal wealth gap is evident in many indicators: unemployment rates, rent hikes, surveys showing heavy economic anxiety. The scourge of hunger is more elusive, often masked by shame and hard-nosed resilience. But well over a million New Yorkers have trouble securing their next meal, surviving on a precarious latticework of charities, government subsidies, and informal social networks. Altogether, according to the latest annual report by the charity network Food Bank for New York City, roughly “1.4 million New York City residents rely on emergency food programs, including soup kitchens and food pantries, each year.” This includes nearly 340,000—about one in five—children, one in five seniors, and nearly one in three veterans. About the same number, 1.3 million New Yorkers, are food insecure, meaning they lack a stable, adequate everyday source of food. While hunger has always been a pernicious fixture on New York’s landscape, today’s food insecurity reflects rising economic precarity at many social levels, from unaffordable housing to unstable jobs: One in every six people on a crowded subway car may be returning from work to an empty fridge, or beg for a rent extension to pay for groceries, or skip dinner to ensure their children eat their fill, or quietly add extra oatmeal to beef up an otherwise skimpy meatloaf. Hunger patterns follow neighborhood segregation lines. About one-fifth of Bronxites and Brooklynites are food insecure, compared to just 11 percent of Staten Islanders. Reflecting nationwide racial disparities in food security, according to a 2012 Food Bank survey, nearly 40 percent of Latino New Yorkers and over a third of blacks “report buying less food to save money,” compared to the (still stunningly high) 23 percent of whites. Similar proportions report eating smaller meals to make do. And a paycheck is no guarantee of food security, since many jobs often fall short of a living wage: nationwide, Latino households with children depend on food aid at a higher rate than the general population, yet these families are still “more likely to have one or more members working” compared to the general population, according to Feeding America. In perhaps the most paradoxical illustration of the city’s food insecurity, the restaurant workforce, running on tipped wages and unstable schedules, is one of the hungriest in the region: According to Restaurant Opportunities Center-NY, about a third of restaurant workers suffer food insecurity, with even higher rates among undocumented immigrants and workers of color. Besides outright scarcity, variety and nutritional value is often lacking. Many of the families surveyed by Food Bank reported trading quality for quantity by purchasing cheaper, apparently more filling pastas and rice. About a fifth of low-income residents reported they struggled “to provide adults in their household with healthy, nutritious foods.” A larger proportion of blacks and Latinos than whites reported buying less healthy foods and “less fresh fruits and vegetables” because of economic hardship. Nutrition-poor diets for people living amidst the world’s most diverse and abundant food markets underscore the depth of inequality, particularly for children whose development depends both on nourishment as well as the other expenses that often compete with food. Blacks and Latinos also tend to make “tradeoffs” between food and rent at three and four times the rate of whites, respectively. At the front lines of the crisis are food pantries and soup kitchens, 90 percent of which have reported an increase in visitors between 2013 and 2015. Reverend C.B. Stewart, with Greenpoint Reformed Church’s food pantry, has observed the clientele diversify over the years as more working-poor families have joined the senior and disability population, including adults working multiple jobs. Coping with hunger becomes a time-consuming daily routine as parents bank on pantries to meet the needs not covered by food stamps. “There’s a kind of catch-22 of surviving as a poor working-class person in New York City being its own full-time job,” he says. 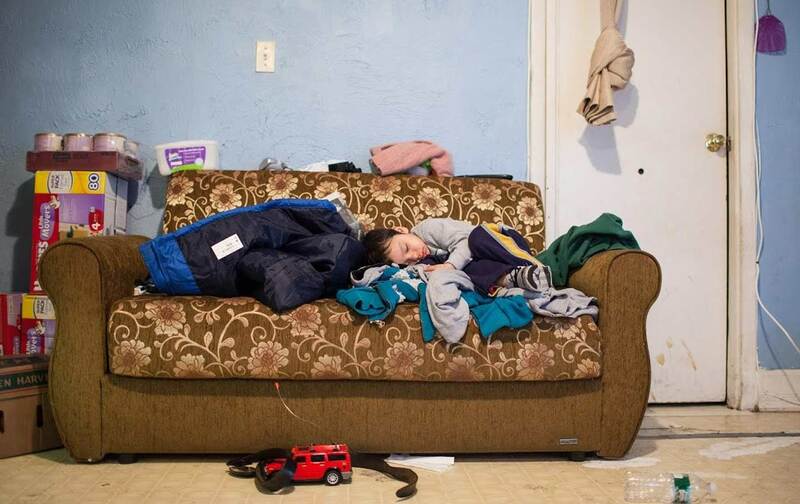 The urban survival instinct is highlighted in “Hidden in Plain Sight,” a multimedia exhibit at Brooklyn Historical Society by Joey O’Loughlin in partnership with Food Bank—depicting the diversity, and troubling banality, of hunger, along with the charities helping families endure with dignity. The Jewish Orthodox families wait at a community pantry to gather Shabbat dinner bread. A Jamaican grandmother holds the fort in a compact Brooklyn kitchen as a grandson scurries past—shepherding three generations of a working-class family from one meal to the next. Another photo shows no people, just a cozy table in Maria Rodriguez’s modest apartment, with tomato slices and bean salad lovingly arranged in spartan mismatched dishes under a canopy of red and white flowers. The caption names the pantry that graced the supper, All Saints in Harlem, and Rodriguez’s young relatives, Ysabella, Yocet, and Diana, who helped set the modest table—a daily ritual for the extended family as their parents work in the Dominican Republic. One of those meals might be this Thanksgiving. But many fellow citizens might devote that holiday to ladling soup for needy strangers. And then comes just another ordinary day of the never-ending quest for the next meal, of hanging by the thread of goodwill that somehow always, thankfully, seems to stretch indefinitely, as does the chronic scarcity we’ve learned to live with.